This war of the Global Islamic Movement versus the Free World is primarily a war of narratives. One narrative says what ISIS, Al Qaeda and all of the other jihadi organizations are doing has nothing to do with Islam. The other side of this coin is called truth. There is no other “version” of Islam. The heads of state of all 56 muslim nations on earth are party to the OIC (Organisation of Islamic Cooperation), which approved the Cairo Declaration on Human Rights on Islam and served it to the United Nations in 1993. 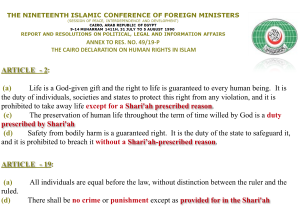 The Cairo Declaration officially states the Islamic world legally defines “Human Rights” as the imposition of sharia on the entire world. Therefore, the leaders of all Islamic nations on earth have the same understanding of human rights as ISIS and Al Qaeda. The Islamic Movement’s primary strategy is to control the narrative about Islam in order to keep the very people who need the truth to do their jobs ignorant about Islam. This includes leaders in the key sectors of our society: political, media, educational, religious, national security, military and law enforcement. Propagating a counter-factual understanding of Islam allows the enemy to wage Civilization Jihad by OUR hands, and get our leaders to do their bidding for them. In 2005, the U.S. government wrote the constitutions for Iraq and Afghanistan creating Islamic republics under sharia. We did that and in the process achieved Al Qaeda’s goals for them. That is Civilization Jihad by OUR hands. Propaganda to support the enemy’s strategy comes from a variety of sources. “Moderate muslims” are one of the most dangerous groups which continues to be pushed to the forefront as the “saviors” of this war. The first prominent “moderate” muslim in America shoved down our throats was Abdurahman Alamoudi, who was the Islamic advisor President Clinton who created the muslim chaplain program for the Department of Defense. Alamoudi turned out to be an Al Qaeda financier involved in a plot with Al Qaeda operatives to kill Saudi Prince Abdullah. He is in jail now. The next muslim we were told by the media was the “new face of moderate Islam” was Anwar al Awlaki. When he was not giving talks about Islam at the U.S. Capitol and the Pentagon, he gave Islamic legal counsel to 9/11 hijackers, Major Nidal Hassan (Ft Hood jihadi), and others, and was the leader of Al Qaeda in Yemen. The United States killed him with a drone strike in 2011. He is dead now. Now we have “moderate” muslims all around us being used to “educate” our leaders about Islam. We have suit-wearing jihadis like Mohamed Magid, Sayyid Syeed, and Salam al Marayati, who are all Muslim Brotherhood/Hamas leaders, warmly welcomed into churches, government offices, and public functions. The difference is that leaders of the Muslim Brotherhood, no matter how nice they dress or talk, are enemies of the United States and should be treated as such. Raheel Raza may truly believe what she says and may be a pleasant woman. The point is that her message supports the enemy’s narrative. Since this is primarily a war of narratives, that puts her in the enemy camp, even if she does not intend to be there. The emotional connection many Americans have to the likes of Raza and the others make the truth of this reality difficult for some to swallow. Nonetheless, it is the truth. Some are unable to detach their emotions from their intellect and see that to be a tool of the enemy makes a person an asset of the enemy, whether he/she intends that or not. When it comes to officials inside the Trump administration, the problem also becomes more difficult for people to receive because of the fierce loyalty of President Trump’s supporters. With regards to Mr. Trump’s National Security Advisor Herbert McMaster, UTT does not dispute his war record or his desire to do what he believes is best for his country. Desire has little to do with this. One does not have to know or understand he/she is a tool for our enemy. As UTT documented in last week’s article here and in our recent video here, Mr. McMaster is ignorant of Islamic doctrine (sharia) and does not appear to concur with Richard Higgins’ assessment that a coalition of Marxists and Islamists are working together to overthrow the United States, despite a mountain of evidence to support this reality. Thus, when Mr. McMaster keeps people inside the White House who he believes have a more “measured” perspective yet are also ignorant of the Islamic threat – many of whom support former President Obama – and he purges the all of the people who do, in fact, understand Islamic doctrine and how the enemy intends to win this war – like Richard Higgins – that is Civilization Jihad by OUR hands, whether Mr. McMaster knows it or not. 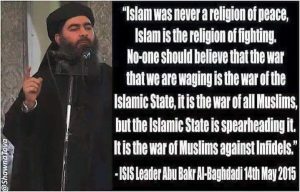 Anyone who is unaware that Islamic sharia supports what ISIS and Al Qaeda are doing and that the Muslim Brotherhood’s by-laws and strategic plans call for the overthrow of the U.S. government does not understand this war. That makes such a person ignorant or complicit. Either way that person need not work in the national security realm. 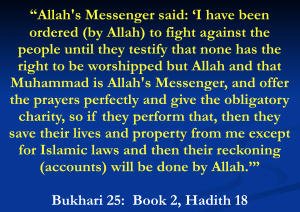 Anyone who gives a platform to “moderate muslims” or anyone else who speaks untruthfully about Islam serves the objectives of our enemy and, therefore, stands in the enemy’s camp. Wake up America! You are being deceived from within the ignorance of your own government! You are the Winston Churchill of our time. “Moderate Muslims” are either living in wishful thinking that Islam can be reformed, or they are actually part of the game called “good cop – bad cop” where one side acts friendly, caring and claims to really be for “peace” while the other side is strictly hardline, violent and lives to wage jihad against all non-Muslims. Thank you for your ongoing mission to inform America and in responding to the misleading beliefs that Islam can be “reformed.” The Truth is that Muhammad was NOT a Moderate. I believe that the only real change a Muslim can make is to accept and follow the New Testament teachings of Jesus (Isa’) whom they claim to respect and revere. Thank you so much for this posting. I wish all Americans would read it. There must be a way of helping “Infidels” to understand what peril we are in by not seeing what Muslim ideology is really about. I can’t believe how ignorant socialists are regarding this subject??? They continue to defend it and deny it’s true definition !!! Assimilation is not even a word in the Muslim dictionary. The three stages of Muslim Jihad are laid out in the magazine “Christian Research Journal” Vol. 36/ No. 01/ 2013. 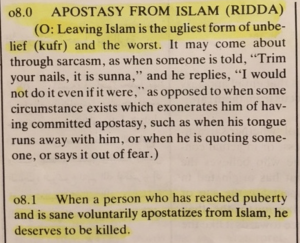 “Moderate” Muslims are part of stage one Jihad (stealth Jihad), stage two Jihad (defensive Jihad) is very broad and includes physical and/or intellectual threats against Islam, stage three Jihad (offensive Jihad) is violent subjugation of non-Muslims. Those that don’t understand the threat Islam poses for the west are dangerous indeed, especially when they hold positions of power. What the article says is generally true, but Islamic Law/Sharia is clear. Mohammad is the perfect example of a man according to Islam. He conquered other regions/nations by first educating and training the muslims, then by peacefully resisting unislamic rule. Then muslims forcefully resisted unislamic rule, and then they migrated in large numbers into the lands to be conquered. Then the FINAL STAGE was violence against the non-muslims until they accepted Islam, submitted to Islamic law or were killed. The Muslim Brotherhood’s irrefutable declaration of war against the United States encompasses an evidence document seized by the FBI from a subterranean basement in Annandale Virginia in 2004. Anyone wishing to read it – thus protect themselves & their significant others from the 29 battalions of uniquely mandated sharia-adherent killers who came here to enslave us under the draconian ideology known as sharia – may due so for but a nominal handling fee by contacting http://www.securefreedom.org thence requesting: GOVERNMENT EXHIBIT 003-0085 3:04-CR-240-G U.S. v. HLF, et al. More to the point, based on population, Minnesota’s Hennepin County ranks 35th in the country, encompasses 607 square miles of the beautiful & storied “Midwest” and is governed by a seven member board of commissioners who stand for election on an ostensibly nonpartisan political ticket – as do it’s sheriff and leading attorney. In March of 2016 the federal government awarded Hennepin County (think Minneapolis) $400,000 in federal grants to be used essentially for obviating a vague “sense of alienation” and “lack of inclusion” sharia-adherent Somali males had been experiencing since arriving in the United States, I.e., which had resulted in the surreptitious departure of 22 into the mid-east ranks of ISIS. Actually the fraudulent impostors were being paid by the American taxpayer for “agreeing” not to commit lethal crimes in Hennepin County. Furthermore, the rules-for-radicals-like interruption UTT had to endure during the 2017 Sheriff’s Association Expo in Reno Nevada may have had far uglier roots than even imagined. I.e., if the lapsed time & expenses of the Hennepin County Sheriff’s trip to Reno were on the clock, thus effectively paid for by the political constituents who elect him, (sharia-adherent subversives perhaps), and any contextual evidence of collusive pre-planning exists, emails etcetera, particularly any revealing an INTERSTATE attempt by the “nonpartisan” Hennepin County Board of Commissioners to interfere UNDER-COLOR-OF-Law with UTT’s 1st Amendment Constitutional right of free speech, being referred to as America’s apologist for.all-things Islam will be the least of his worries. Right on the mark as always Donald. Thank you for your insight.